Industry experts have proven conclusively that exterior continuous insulation is the most effective way to insulate building envelopes for energy savings. 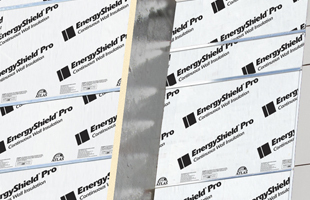 Atlas EnergyShield wall insulation products are made with a polyiso core, which achieves a higher effective R-value (the capacity to resist heat flow) with minimal material thickness. It’s the only foam plastic insulation that can be used in basements and attics without the need for a thermal barrier, meaning walls insulated with Atlas EnergyShield products can be installed without the cost of additional layers. In fire testing, polyiso chars in place and doesn’t melt or drip like other foam plastics. With more than 30 years experience in manufacturing polyiso, you can trust Atlas to deliver the absolute best in wall insulation performance. The most thermally efficient rigid board insulation available. Highest R-value per inch of thickness.